“Danny Boy”, the song that’s often heard in the bars of Ireland, and also at certain events, particularly funerals, is considered by many of the Irish population as an unofficial signature tune. Indeed it's very well known to everyone of a certain age. But not everyone is aware that the melody itself is known as “Londonderry Air”. A woman called Jane Ross recorded this and indeed a plaque sits on the wall of the house she formerly lived at, in the town of Limavady. Disembarking the 212 Maiden City Flyer on Saturday morning I took in a gulp of that fine Londonderry air and perused the bus timetable for the next stage of my Irish tour, it was time to head East to the aforementioned town to visit a football club that’s been on my radar for some time now. When I first started to get interested in football across the water, it was both the North and the South that captivated me, and it worked well because I devised a series of plans whereby I would get to a Southern based game on a Friday, and then a Northern game on the Saturday. At the time the top flight in the North was bigger than it is now, it contained 16 teams, whereas nowadays that number is just 12. Limavady United, located between Derry and Coleraine, joined the then Irish Premier League in 2003 where they remained until 2008 when a second bottom finish saw them drop into what became known as the Irish Championship. In the 2004-05 season they recorded a best ever finish with a hugely impressive fifth place. 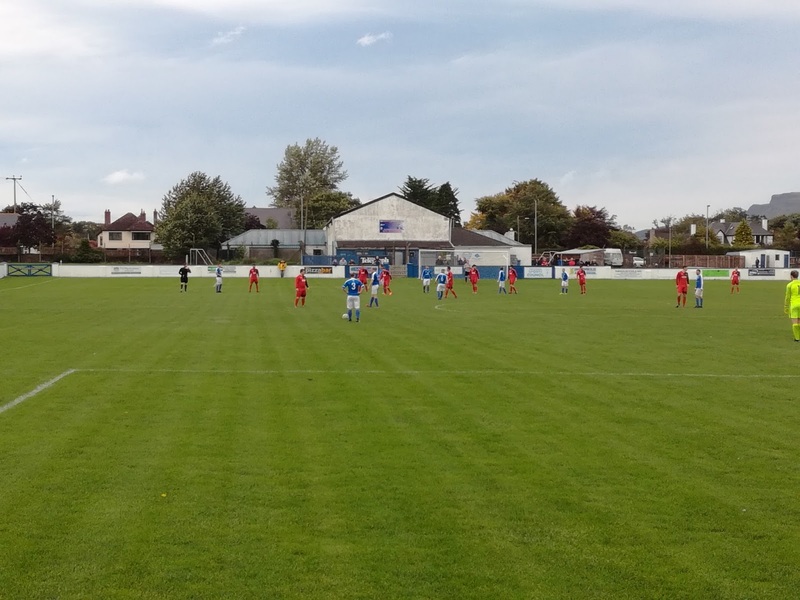 In all fairness though, when the 2008-09 season came around, Licencing had come into play and Limavady in all probability were going to struggle to get through the process, mainly due to the facilities at the Showgrounds. 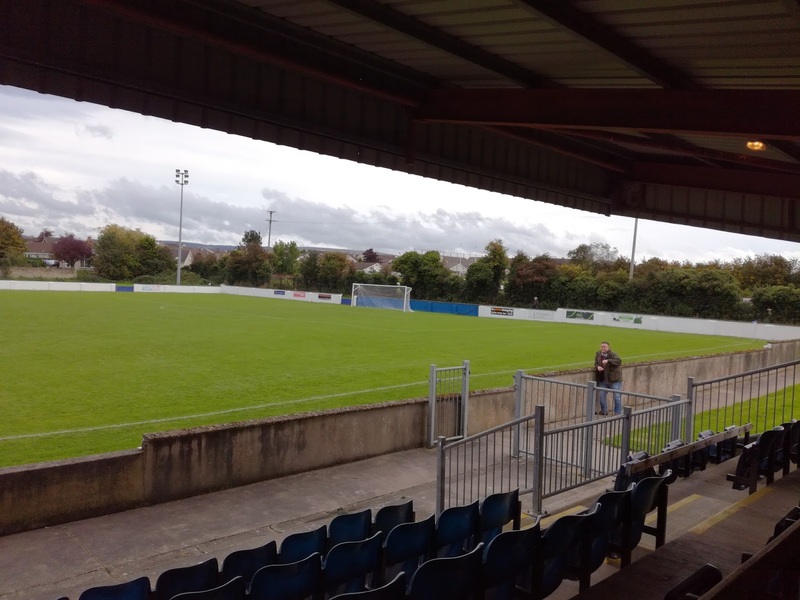 The club actually fell to its lowest level in modern times a few years ago when they dropped into the third tier of Irish football, but after they were denied promotion when winning the league in 2015-16 courtesy of failing to apply, they did eventually repeat the feat again last season and were accepted back into the second tier. The journey to Limavady takes around fifty minutes from Derry, passing through Eglinton and Ballykelly, while from the top deck of the bus the views to the North over Lough Foyle towards Quigleys Point are spectacular. Limavady is a very nice town, extremely well kept, award winning in fact in the ‘Best Kept Town’ category for Northern Ireland. I firstly hunted down Jane Ross’s plaque, but then quickly found my way into the excellent Granny Annie’s bar. If you ever get a chance, the toilets are simply stunning! After spending far too long admiring the toilets, I felt it best to make my escape and that took me to the Corner Bar, the Rangers v Celtic game was showing, the locals were far from happy. Limavady is a Loyalist town. 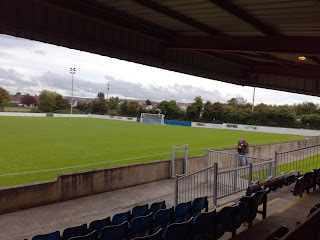 The Showgrounds are a modest walk to the East of the centre of the town, and I made it in quick time, but hopes of a pre-match snifter were scuppered somewhat as a celebration lunch was taking place in the bar, to remember a man called Thomas St George McCarthy who was one of the founding Fathers of the Gaelic Athletic Association, a Royal Irish Constabulary Officer and indeed a former Limavady resident. "I Either Book You - Or He Arrests You?" It was a well attended and also carefully thought out strategy by the club to host it on the day when the opponents were Police Service Northern Ireland (PSNI). An esteemed guest in the form of Assistant Chief Constable Stephen Martin gave a speech at the dinner and watched the game from the stand. 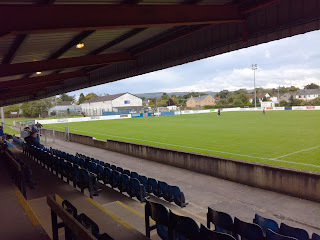 The ground at the Showgrounds is neat and tidy, but quite simplistic. 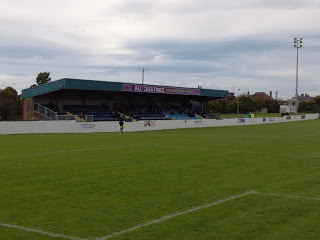 A large car park with the function rooms and the dressing rooms sitting adjacent stands behind the goal. 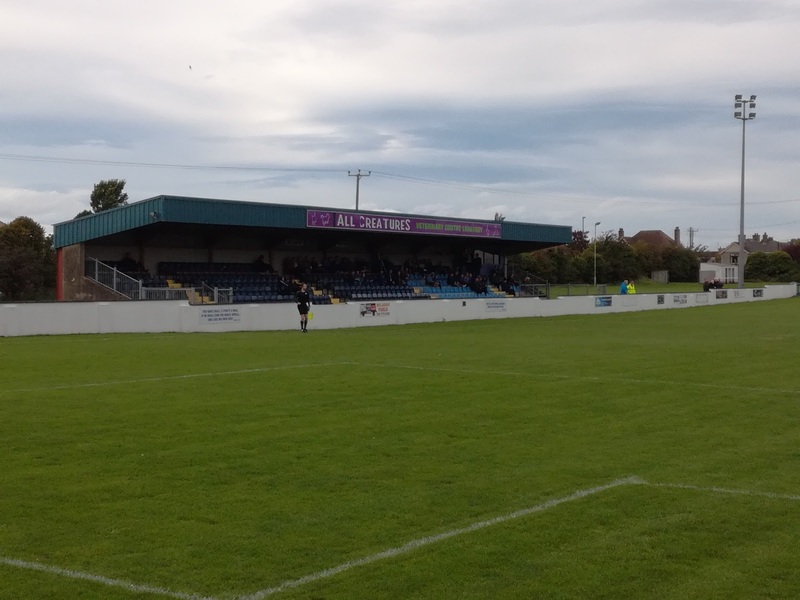 The turnstiles are to the left, and once inside you find a walled pitch surround with hard standing, while a seated stand for approximately 300 straddles the half way line. It is a big area though, with large grass expanses on all sides, so plenty of room for development if funds and desire allow. 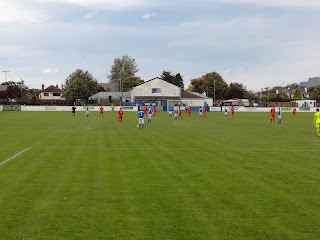 Limavady took the lead after just 21 seconds when Joel Bradley found the net, but gradually the visitors came back into the game and equalised after 19 minutes via an Alan Wright header from six yards. 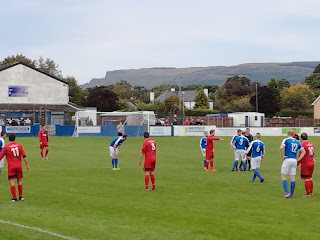 The points went the Roesiders way courtesy of a 72nd minute penalty that was despatched by Robbie Hume, and despite late pressure and what seemed like an age of added on time, it was the hosts who managed to hang on. I made the bus connection back to Derry with a couple of minutes to spare, and later that night I stepped out into the ‘Derry Air’ (got to get the balance right!) to meet friends for a meal and a few drinks. The following morning as I wandered back into the City I came across the PSNI again, this time in uniform. Around the time I had been walking back through the Bogside to my lodgings, a 19 year old boy had been killed on William Street following an altercation. Another funeral, another tragic waste of life, quite possibly another desperately sad and poignant rendition of Danny Boy will take place. The Londonderry Air felt very sombre and heavy that morning.